As a designer for ZnetShows Inc. it has been my pleasure to work with so many talented people. We are given the opportunity to design with such great products. There are times when we do NOT know what beads we will be given and what the theme might be. Other times we are allowed to choose whatever we want to work with. I am not really sure which I prefer. Both are such fun. 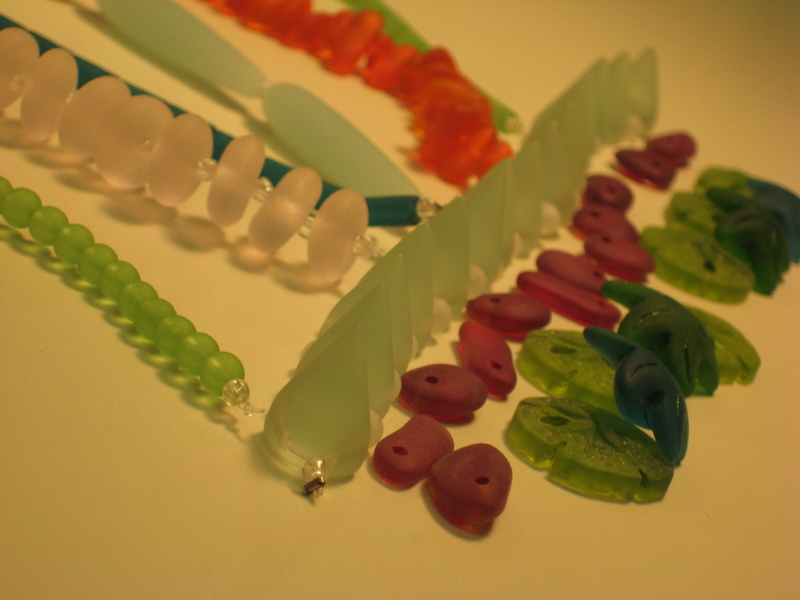 As many of you beaders know, finding new beads to work with can be a challenge or at the very least expensive. I find new and exciting things each and every time I shop from ZnetShows Inc. Please take the time to look at all the wonderful work done by so many designers. We love designing for you. Visit their blogs and pages. My work can be found on pages 24-26 . You can see more about ZNetShows here: www.facebook.com/znetshows & www.znetshows.blogspot.com They also sell Wholesale . In this challenge, we were given the theme “ICY”. Here are the beads they sent me. This is my husband Larry. Last year when Atlanta was shut down for several days due to ice, snow and 18 wheeler traffic jams, he was caught in the storm overnight. 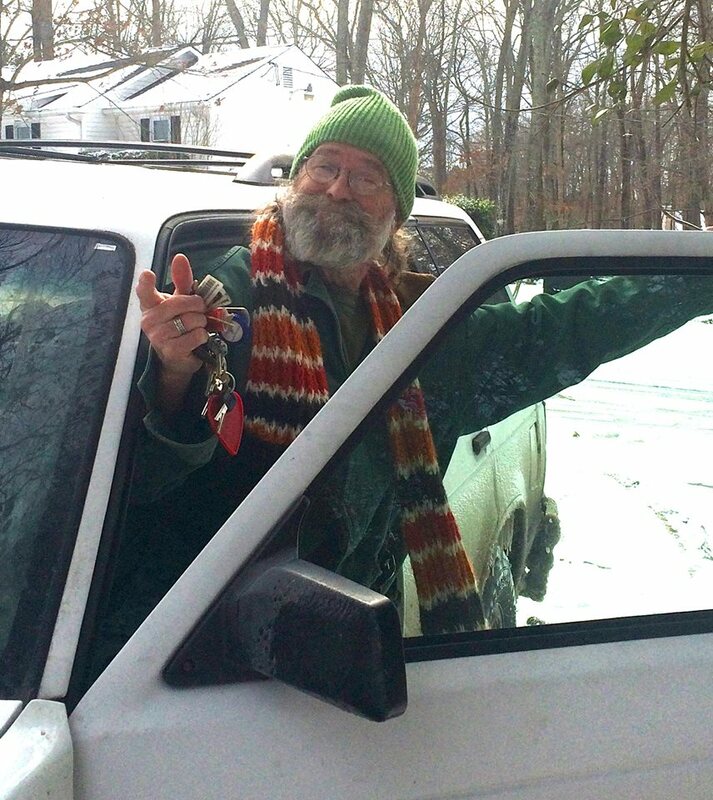 I called him every hour to make sure he was ok.
My car had these “ICY ALIENS” on all four wheel…My Inspiration !!! 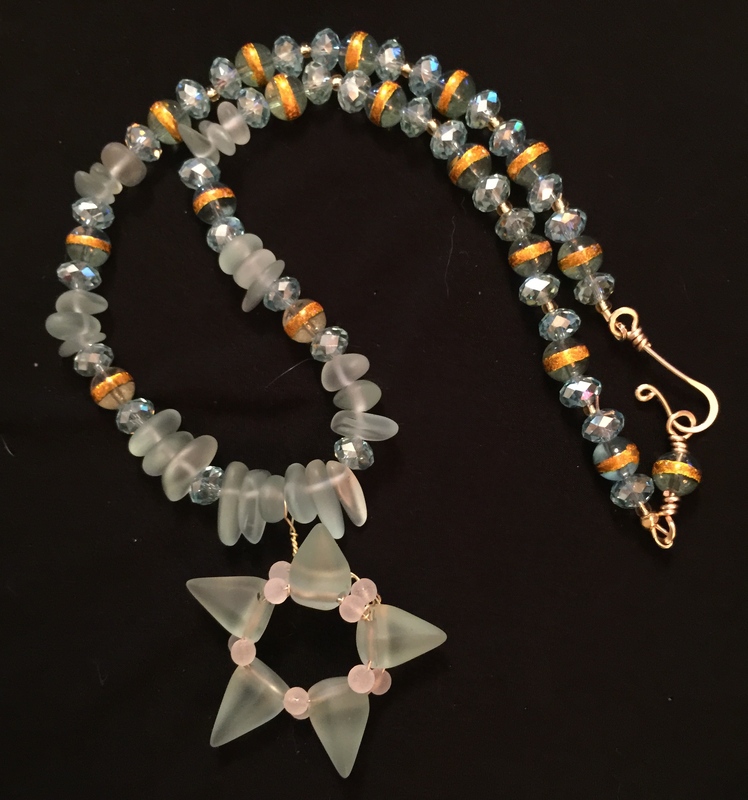 I wired the cones into a star shape and made a handmade clasp and ear wires. 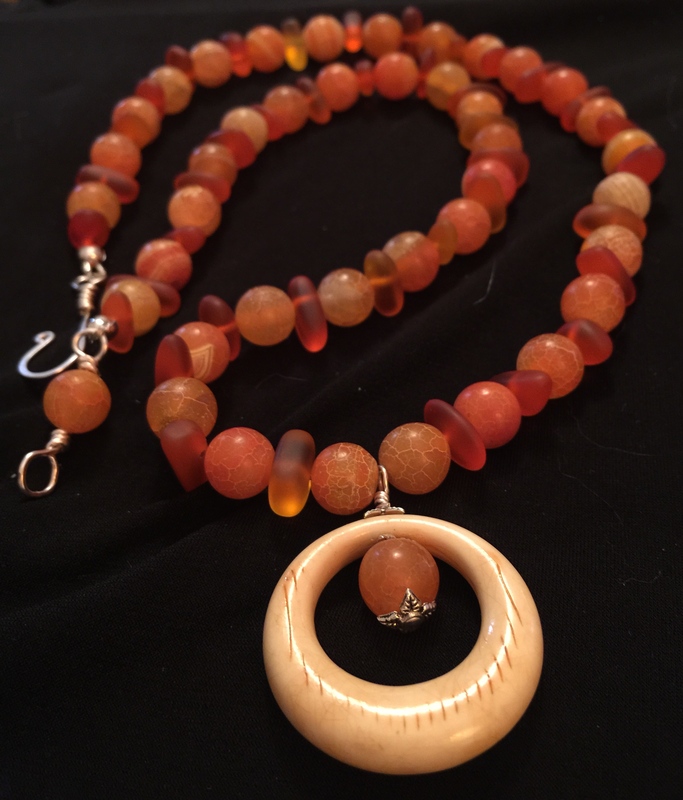 My next challenge was to use the beautiful Cultured Sea Glass pebbles in Tangerine. Hmmm????? Orange and Icy. Aha , as a former bartender I decided to call this one “Tequila Sunrise on Ice.” I added a handmade gold clasp and ear wires. TA DA !!!!!!! 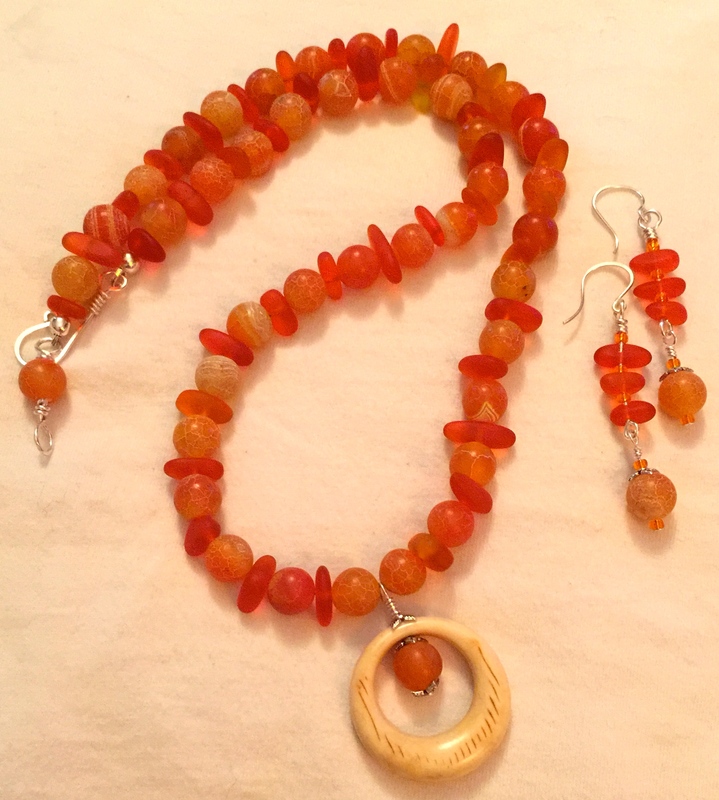 I used ZNetShows’ S50-B83FIVE Cultured Sea Glass freeform button spacer Beads in Tangerine. 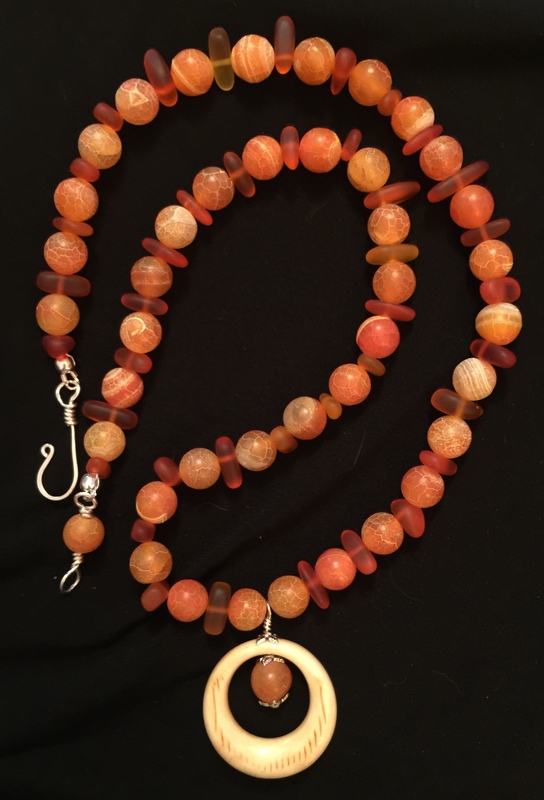 I added a bone focal, some beautiful Orange Agates and well as a handmade silver clasp. The earrings have handmade silver ear wires. Thirsty Yet? My next creation was fun to make. 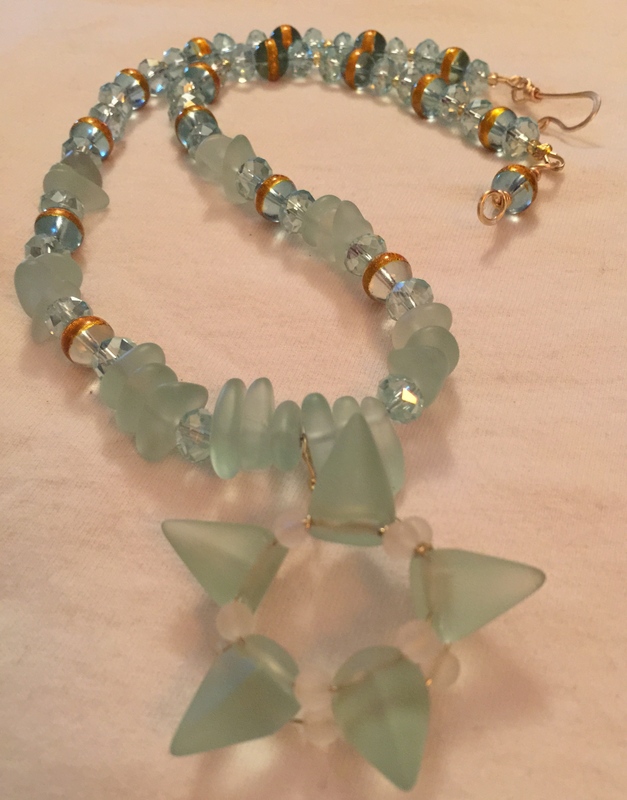 You see the glass beads I used were “glow in the dark” The beads reminded me of the new grass under the ice. I call this “Glow Worm” I added a Tibetan Hand Carved Ohm pendent. 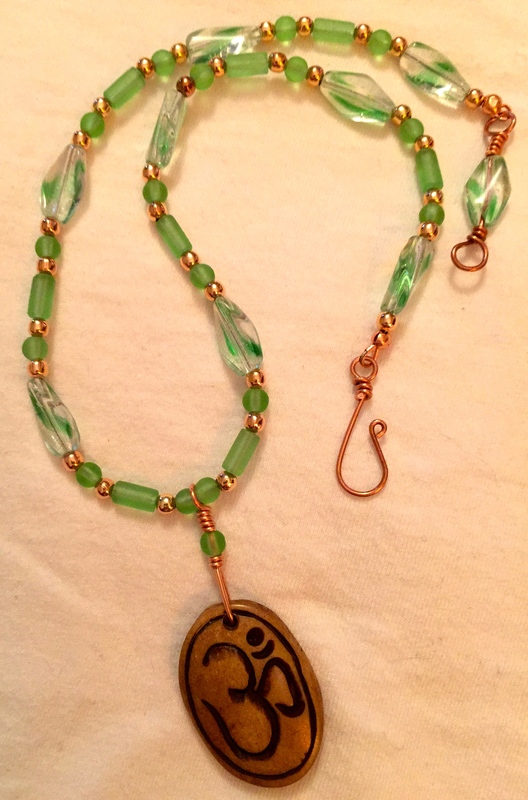 I matched this with some copper beads and a hand made copper clasp. 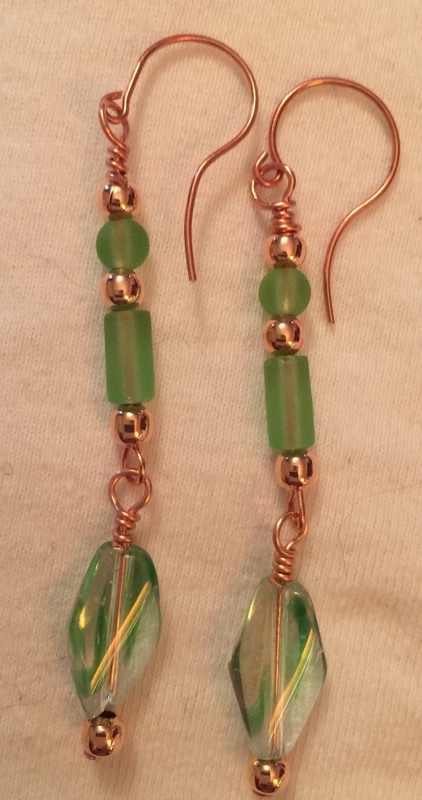 I used S03-20-ONE-Cultured Sea Glass rounds 4mm 2-0 in Light Olive and S81-B23-Cultured Sea Glass tube beads in Peridot. A special thanks to Bill and Hope for everything they do and everything they let us do!!!!!! Please check out my other sites for more jewelry designed by me, made by me and for sale from me !!! 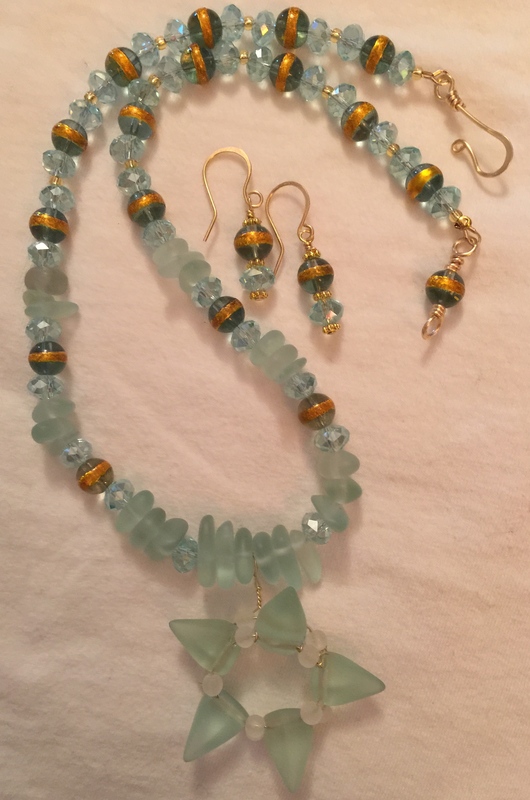 This entry was posted in Challenges, My Creations, ZNETSHOWS, ZnetShows, Inc. and tagged sea glass, ZnetShows Inc.. Bookmark the permalink. ← Yay !!!!!! Its Creative Spark Magazine time again. Thank you again Hope Smitherman for all your help and encouragement. Hi Susan, Your Alien Ice focal is really unique good job. 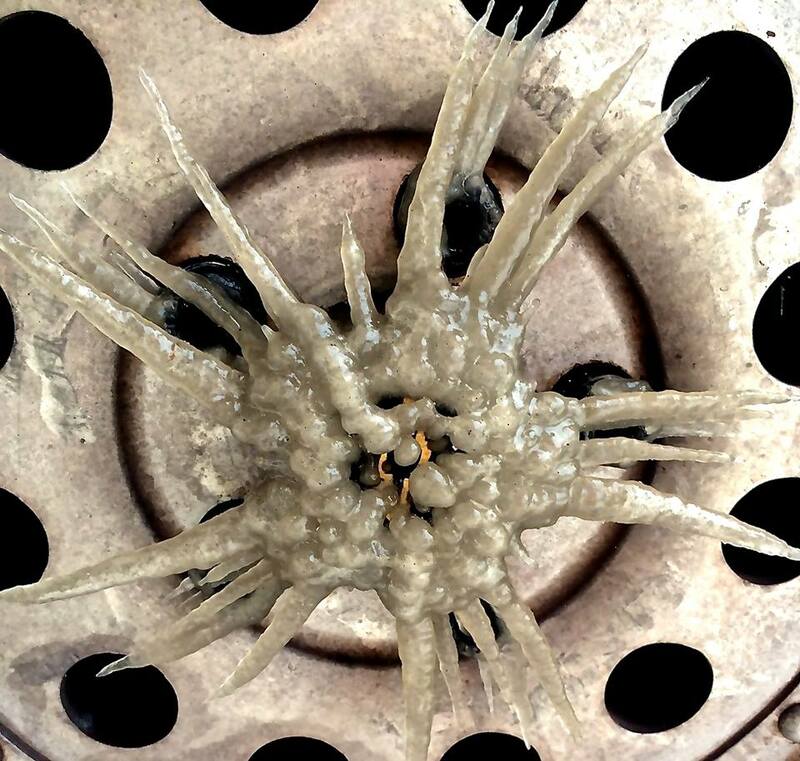 I like the icy hubcaps pic too.